Events will be a normal ride of approximately a hundred miles. The goal is to discover the least amount of energy - in dollars and cents - it takes to travel the way we really drive. Some Challenges will be at 65 mph through the midwestern countryside. Other Challenges may be held in mountainous areas between Las Vegas and Barstow. 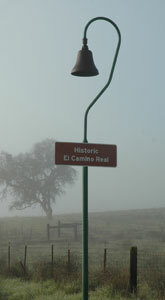 California's Highway 101, El Camino Real is my favorite and most challenging because the posted speed is 70 mph and the headwinds can be 30 mph plus. "Vetter Conditions" represent reality; never "controlled" conditions like on tracks. A Leader sets the pace. I will be the "Follower" at the back of the pack. All entrants must stay between the Leader and Follower. Acceleration will always be brisk but all road rules will be obeyed. If, for any reason, you drop behind the Follower you will have disqualified yourself from being considered a winner. Of course, you may still continue and enjoy the ride. Don't fret... we will stop mid-way for a break. Some Vetter Challenges will be for motorcyle-scooters only...2 or 3 wheeled vehicles. Occasionally, I will allow 2, 3 and 4 wheelers to run together, just like in real life. I, for one, would like to see the claims of car makers in real world driving, wouldn't you? This will be Gasoline and Diesel sold at a common station in close proximity to the end of the challenge. Since you are expected to arrive at the Challenge filled, Challengers will be on their honor to certify that they consumed the same type and grade of fuel consumed during the Challenge. The Best Traditional Fuel award will go to the Challenger that meets the Vetter Conditions* while consuming the least fuel as measured in dollars and cents. 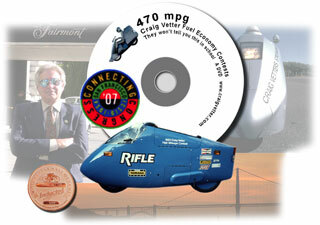 Results will be posted in both mpg and cost per mile. Electric Challengers are not yet expected to go the standard 100 or so miles. That said, we will identify the “Best Electric” as follows: Electric Challengers will agree among themselves how far they will ride on the Vetter Challenge before turning around and returning to the starting grid. The return ride will be led by a rider with nerves of steel, at the same speeds as on the route out. Upon returning, the electric Challengers will recharge their vehicles from the grid. They will be responsible determining the cost of the electricity actually used per machine. Applicable road taxes  by definition the same cost per mile that Craig Vetter’s Challenge machine consumes - will be added to get a final cost. Results will be posted as cost per mile. We want to encourage innovation in machines and fuel. Therefore, this category will include bio-fuels, like bio-Diesel and ethanol blends of 20% or better... energy sources not generally available at gas stations. All other fuel sources will fall into this category until further notice. The cost of any alternate energy fuel will be the most reasonable local cost, including local taxes. It will be the Alternate Fuel Challenger's responsibility to provide proof of cost. Some Alternative Fuels will be "outside the law," not having been thought of as vehicle fuel. If road taxes have not been figured into the cost of the Alternative Fuel, the same tax cost per mile that Craig Vetter’s Challenge machine consumes will be added. Should there be any disagreement, Craig Vetter will make the final decision. 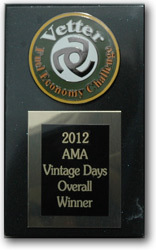 The Overall winner will be the top Challenger meeting Vetter Conditions from the above categories consuming the least fuel in dollars and cents. Results will be posted in mpg (if possible) and cost per mile. Ability to stay with the group for the entire ride. As always, it is the responsibility of the vehicle owner/rider/driver to make sure his vehicle is legal to drive on public roads and any and all applicable local, state and federal Motor Fuel and Alternative Fuel Taxes are paid. As always, Craig Vetter is the final judge. It is my desire to not change the rules. A lot of work goes into building these bikes. Do you want to win the Challenge? Harvest your energy from the sun at the Challenge. I will allow 24 hours of solar charging. Isn't this is how we should be living, anyway? Before departure, the four grocery bags must be fitted acceptly into each machine. The bags must be upright. When available, a real wife, like Carol Vetter, will decide if the bags are being packed to her satisfaction. 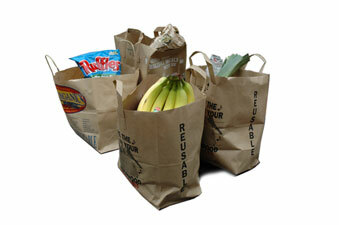 If any part of the bags are exposed, you will have to ride in the Challenge with the grocery bags filled and in place. The reason is simple: If the groceries are exposed, you and your machine will be aerodynamically "dirty." (You will probably loose some groceries, too) In addition, you will consume more fuel as your engine tries to push you through the air. If the groceries are within an enclosure, they are not likely to affect the mileage. Obviously, you must carry that bag enclosure bodywork on the ride. As long as you demonstrate before the ride that the four bags of groceries can fit totally enclosed inside your bodywork, you are not required to carry the groceries on the ride. You may use that space to carry your clothing, cameras, etc. New July 10: On electric bikes, if the storage space has batteries or chargers in that space that are used on the ride, they must be in place for the bag check. If you can not carry groceries, you will still be welcome to ride the event. You just cannot be declared a winner. I have measured the bags we get in California. The base is 12" x 7". They are 14" high. Because stuff sticks out the top, figure we need 20" of vertical space. One calculating Challenger figured that the four bags of groceries amounted to about 4,000 cubic inches of volume. He asked if it was really volume that we are interested in. I explained that when Carol sends me to the store, it is to pick up groceries, not 4,000 cubic inches of something. Its gotta be a real load - like grocery bags - if we are going to help to make motorcycles more useful. 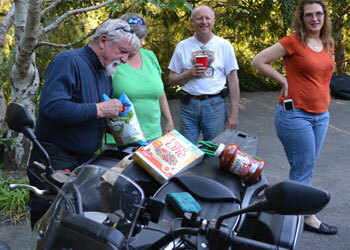 At the Quail Ride of 2013, it took Reg Kittrelle and Terry Hershner the better part of a half hour - each - to put four bags of groceries on their bikes. This is not reasonable. Subsequently, I loaded four bags of groceries from the ground next to the vehicle: To put them in my car, it took 22 seconds. Easy. 26 seconds to put them in my streamlined Helix. Therefore, beginning at the 2013 Las Vegas to Barstow Vetter Challenge, to qualify, you must be able to load your groceries - by yourself - in 45 seconds - to the satisfaction of the Bag Judge, the beautiful Carol Vetter, otherwise known as Craig's wife. If you cannot carry the required 4 full paper bags of groceries, you can still enter the challenge, but you cannot be declared a winner, no matter how little fuel you consume. This is non-negotiable. If you cannot maintain the speeds and/or the distance, you will still be able to participate but cannot be declared a winner. Comfort is a major goal. However, since I have not figured out a way to measure comfort, comfort will not be a consideration for qualification or disqualification. It is your responsibility to be "Street Legal." If you get a traffic ticket during the Challenge, you may not be declared a winner. Craig Vetter will always be the final authority. We welcome any Challenger. Just play by the rules. 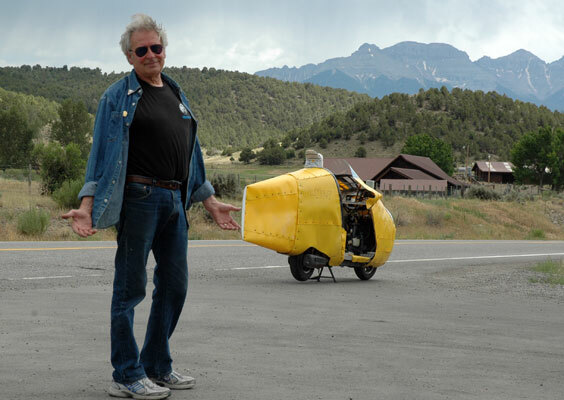 By entering the Craig Vetter Challenge, you will be making motorcycle history. June 2, 2011 Fred asks: You have three classes at VMC, Open, Classic, and Electric. Would adding a Production and Modified Production Class help encourage more people to enter? More classes would attract more riders, but what would we learn that we don't know already? Back in the 80s, I had a bunch of classes, based upon engine size. In that era of 55 mph speed limits, 125-180 cc machines provided the winning power for performance and mileage. Over 400 mpg was possible because somewhere around 3-5 horsepower was needed. Today, the conditions are different. We go faster, comfort is important and carrying capacity is important. We have already learned that we need somewhere between 17 and 31 horsepower. We must continue to narrow this down. We have just begun. How did they do it in the Craig Vetter Fuel Economy Contests of 1980-85?